In addition to the free ebook, you will also receive a complimentary subscription to the Future Works® Gazette, a monthly eletter with strategies, tips, and advice on how to make your future rock (unless you opted out–we completely respect your privacy). 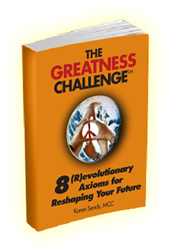 Questions about how to reinvent your future? Send your inquiries to Karen@KarenSands.com. For over thirty-five years, I have mentored accomplished women and men, conscious entrepreneurs, and enlightened leaders to greater futures, and I now am available to answer your concerns in my eletter and blog. The confirmation email will come from Karen@KarenSands.com Just open it and click on the link to confirm your address. That’s all there is to it. The whole process should only take a few moments. I look forward to making the future great together.